In the previous post, I mentioned one good news — that you can now participate in the Forum page of this website. In that page, you can ask questions and also answer questions made by other participants. The page is still in the testing phase, but you can already use it. To use the Forum, you have to register (how? ), and upon registration, a password is sent to you via email. That password is quite long and it is hard to remember, so you might want to change it. Here are the steps. 1.) Go to the login page. 2.) Login with your email and the password sent to you when you registered. 3.) 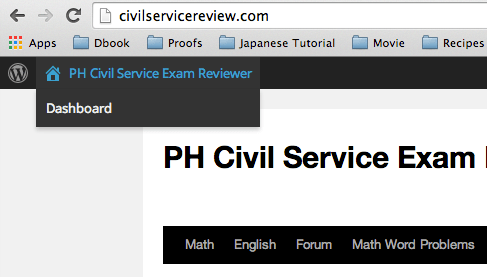 Once logged in, you will see the Ph Civil Service Exam Reviewer menu at the top-left of the page. 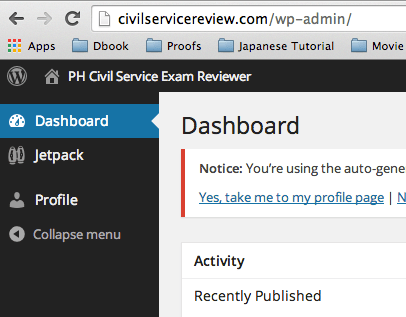 Click it and the click on Dashboard. 4.) In the Dashboard, select Profile on the navigation menu (left hand side). 5.) In the Profile page, scroll down, change your password and click Update Profile at the bottom of the page and you are done. Now that you have a new password, you can now use the Forum with ease.